It has been stated that only the person who can face the prospect of death realistically is able to live this life with purpose and confidence. Such was the conviction of a rather obscure English pastor, Henry F. Lyte, when he wrote the text for this hymn in 1847, shortly before his own home-going. It has since become one of the favorite hymns for Christians everywhere during times of sorrow and deep distress. Henry F. Lyte was born in Scotland on June 1, 1793, He was educated at Trinity College, Dublin, Ireland, and was a member of the Church of England all of his life. Throughout his lifetime he was known as a man frail in body but strong in faith and spirit. His health was continually threatened by asthma and tuberculosis. Despite his physical frailties he was a tireless worker with an established reputation as a poet, musician and minister. It was he who coined the phrase, "It is better to wear out than to rust out." Wherever he ministered, he was greatly loved and admired by his people. For the last twenty-three years of his life Lyte pastored a poor parish church among fishing people at Lower Brixham, Devonshire, England. During these later years his health became progressively worse so that he was forced to seek a warmer climate in Italy. For the last sermon with his poor parishioners on September 4, 1847, it is recorded that Lyte nearly had to crawl to the pulpit and his message came as from a dying man. His final words made a deep impact upon his people when he said that it was his desire to ' 'induce you to prepare for the solemn hour which must come to all by a timely appreciation and dependence on the death of Christ." On his way to Rome, Italy, he was overtaken by death at Nice, France, and was buried there in the English cemetery on November 20, 1847. Lyte is said to have written this text along with his own tune shortly before his last Sunday at the Lower Brixham Church. It never became widely used in England until it was first published in a book, Lyte's Remains, in 1850, London. Its first appearance in America was in Henry Ward Beecher's Plymouth Collection in 1855 with the notation that "this hymn was meant to be read and not sung." Later it was discovered by William Henry Monk, music editor of the well-known Anglican Church hymnal. Hymns Ancient and Modern, and it was included in the first edition of that hymnal published in 1861. Altogether William Monk personally contributed fifty original tunes for the hymnal. It is said that in less than half an hour he composed for Lyte's text a tune named ' 'Eventide." He was inspired by the beauty of a glorious sunset while yet experiencing a deep personal sorrow. In addition to his work as editor of this hymnal, considered by hymnologists to be one of the most important hymnals ever published, William Monk was also choir director and organist at King's College, London. William H. Monk also supplied the music for the hymn, "Look, Ye Saints' The Sight Is Glorious" (No. 55) and "The Strife Is O'er" (101 More Hymn Stories, No. 88). 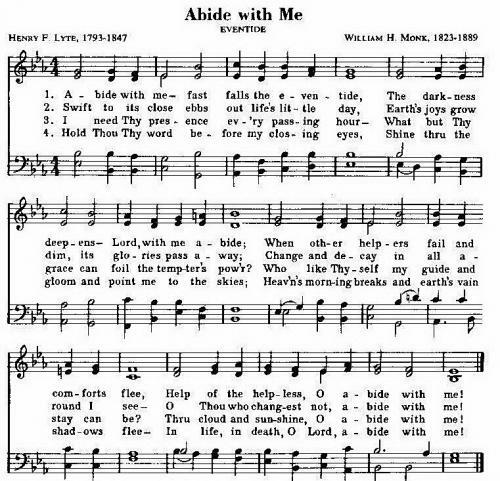 Henry Lyte's text for this hymn was taken from the account of Christ's appearance with the two disciples on the way to Emmaus and (heir statement, "Abide with us: for it is toward evening and the day is far spent" (Luke 24:29). Although Lyte did not write a great quantity of hymns, others from his pen include "Jesus, I My Cross Have Taken".